The new artwork for the Purple Line Extension’s tunnel boring machines. From left, Metro Deputy CEO Stephanie Wiggins, L.A. Council Member David Ryu, naming contest winner Marianne Gutierrez, artwork contest winner Lauren Park, L.A. Mayor Eric Garcetti and former Supervisor Zev Yaroslavsky. Introducing the new tunnel boring machines, Elsie and Soyeon! A ceremonial naming and unveiling was held Wednesday morning for the tunnel boring machines that will dig twin four-mile subway tunnels under Wilshire Boulevard for the first section of the Purple Line Extension. Tunneling is expected to begin later this summer. 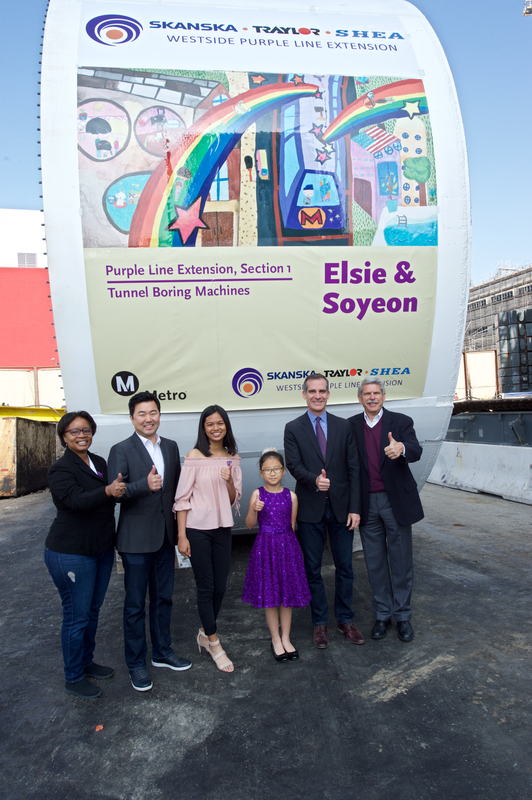 Metro Board Chair and Los Angeles Mayor Eric Garcetti awarded TAP Cards and other prizes to students who won contests to name the TBMs and create illustrations for the TBM tail shields. Over 1,700 votes were cast for the contests. •The names “Elsie” and “Soyeon” (pronounced “So-Yun”) were selected from a winning entry submitted by Fairfax High School student Marianne Gutierrez. Soyeon is Korean for “bright” and “beautiful” and was named after female astronaut and mechanical engineer Yi Soyeon. Elsie was named after Elsie Eaves, the first female to be elected as a member of the American Society of Civil Engineers. •Lauren Park, a third-grade student from Palm Crest Elementary in La Canada who also goes to Prism Art School in Koreatown after school, won the art contest. Her winning illustration showed her ideal community, which included Purple Line Extension service. Metro will issue commemorative TAP cards featuring Lauren’s winning artwork at 7th Street/Metro Center, Wilshire/Vermont and Wilshire/Western Purple Line Stations beginning April 26. •Metro has received the cutterhead and shield for its tunnel boring machines, which are now staged at Metro’s Wilshire/Fairfax station construction yard. The TBMs will ultimately be assembled at the Wilshire/La Brea station site and will first travel east to Wilshire/Western in Koreatown. From there, parts of the TBMs will be retrieved from underground, with the rest moved back to the La Brea Station through the new tunnel. TBMs will then be reassembled and relaunched west to Beverly Hills as part of the first construction segment. Metro contractor Skanska, Traylor Shea, a Joint Venture, is builidng this portion of the project. •The TBMs are manufactured in Germany by Herrenknecht AG. They weigh approximately 1,000 tons, are 450 feet long and are 21.5 feet in diameter. The tunnels will advance about 60 feet per day once digging begins. Twin tunnels will be separated from each other by approximately 16 feet of soil and will be approximately 50 to 70 feet deep, though some areas will be deeper. TBMs will tunnel five days per week, 20 hours per day and take approximately two years to mine both subway tunnels. •The Purple Line Extension is a nine-mile subway project that will extend Metro Purple Line service nine miles west from Koreatown to West L.A. It will include seven new stations at Wilshire/La Brea, Wilshire/Fairfax, Wilshire/La Cienega, Wilshire/Rodeo, Century City and Westwood/VA Hospital. •The first subway segment is scheduled to be operational in 2023. When ultimately completed in 2026, the entire subway extension is expected to serve 59,000 riders daily – including 17,000 new riders. The project was funded by Measure R and accelerated by Measure M, the two most recent sales tax measures approved by voters for transportation improvements in Los Angeles County. For more information on the Metro Purple Line Extension Project, visit www.metro.net/purplelineext. Will these be available in the TVM’s or being handed out?? Brace yourselves, here come the Methane Explosions!! Only 59,000? This could easily be an underestimate. The Expo Line hit 64,000 last year, and a good portion of it doesn’t run along a heavily trafficked commercial corridor. 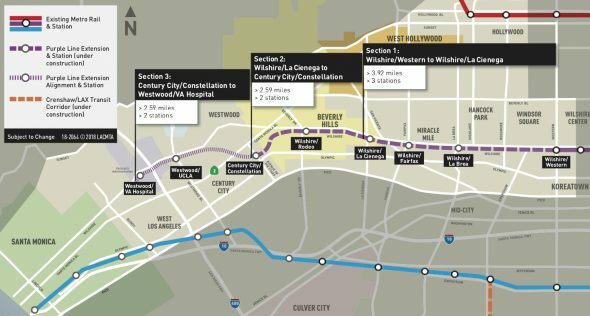 Every planned station along the Purple Line extension is in a busy area, with the possible exception of the VA center – but even that one could become popular as a a dropoff area or bus transfer point, since it would offer a way to get across that giant bottleneck known as the 405. Also, there are a lot of offices next the the VA in the Brentwood area. When you announce TAP cards are being release at 7th & Metro, you should really tell which entrance/exit! Samething for Union Station! I just happened to reload my TAP card at the Fig entrance of 7th & Metro tonight, and saw the sticker for this new TAP card. You should also make sure Metro takes down the stickers when the TAP cards are sold out!!! Just say the TAP cards will be sold at the machines!